Inclusion of 'detestable' pro-boycott groups may splinter parade in 50th anniversary, as Jewish leaders rally and threaten to pull support. 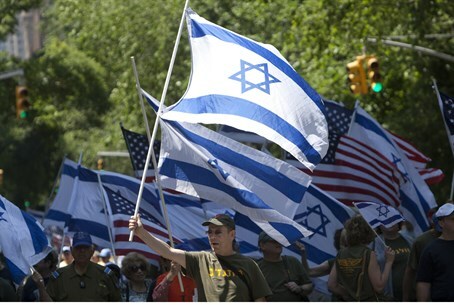 The annual Israel Day Parade on Manhattan's Fifth Avenue, which will take place on June 1, is facing a crisis over the inclusion of three "Jewish groups" that promote the BDS (Boycott, Divestment, Sanctions) movement targeting the Jewish state. Several groups are organizing a protest rally for April 8 as part of a campaign to have the parade sponsors remove their invitations to the controversial groups. Further, unless the groups are pulled, several local rabbis, including day school and yeshiva principals, are considering boycotting the event, thereby significantly reducing the number of participants. Among the BDS-associated groups scheduled to take part: "Partners for Progressive Israel" lists Israeli products to boycott on its website; the New Israel Fund (NIF) has supported BDS and reportedly been encouraging Arab riots; volunteers with B'Tselem have taken part in Arab riots. NIF and B'Tselem have also been implicated in pro-BDS activities, including via subsidiaries, videos and statements. All three are currently set to march in the parade under their own banners. The parade this year is celebrating its 50th anniversary, and has reached a projected size of 35,000 marchers. For the first time, at least four floats representing communities and institutions in Judea and Samaria will take part in the event. However, Rabbi Aryeh Spero, author of "Push Back: Reclaiming Our American Judeo-Christian Spirit," notes that is not a reason to provide a counter-platform for BDS. "Boycotting is an action that far exceeds disagreement. At its core, it is a public venue designed to demonize, ultimately to make something, in this case, the State of Israel, illegitimate. It is a form of anti-Semitism,” the rabbi noted. “These BDS groups work every day to isolate Israel and make her a global pariah, announcing to the world the names of specific Jewish-owned companies operating in Judea and Samaria that they want punished," charged Rabbi Spero. Rabbi Spero adds that "these ‘Jewish’ groups are being invited to infiltrate the Parade, either because of agreement with their tactics or as a way of affirming what the UJA-Federation calls ‘an open tent.’ UJA’s desire for an ‘open tent’ should not devolve into the destruction of the tent." Referring to the BDS claims that they target only areas east of the 1949 Armistice line, the rabbi noted "to the world, a boycott is a boycott, east of the Green Line or west of it. Approving one leads to the other. Boycotting Israel will spur future boycotting of those ‘bad’ Jews, for example, in Brooklyn or London." The rabbi added that the boycotting groups "never boycott Arab or Muslim businesses, despite the ubiquitous terrorism coming from PA neighborhoods and their violations of human rights. Their outrage is only against the Jewish state and its Jews." "Do not stand idly by the blood of your brother"
Showing the widespread fallout the groups' opposition to the parade may bring about, Rabbi Elie Abadie has threatened to pull the support and float of his Edmond J. Safra Synagogue. He also represents the Moise Safra Community Synagogue, Congregation Magen David of Manhattan, and the Sephardic Academy of Manhattan. Rabbi Abadie warned he would be “urging every rabbi and leader of every Sephardic organization—as well as many others—in our community" to boycott the parade if the BDS groups were not pulled. The rabbi decried the BDS-supporters for harming a fellow Jew's ability to earn a livelihood, citing the Jewish legal precept from the Torah "not to stand idly by the blood of your brother." Hinting at the serious implications of BDS, Allen presented a photograph from April 1, 1933, showing Nazi storm troopers outside a store in Berlin with signs reading "Do Not Buy from Jews." Allen noted "it always starts with boycotts." “It remains just as evil today, even when done by Jews, often in conjunction with non-Jewish anti-Semites and others who stand against the Jewish state,” added Allen. Jeff Wiesenfeld, a member of the Jewish Community Relations Council (JCRC) which organizes the parade, revealed the decision process that led to the groups' inclusion. While a majority of JCRC's leadership would have opposed the "detestable" BDS groups, according to Wiesenfeld, "there was no debate. It was a decision handed down from ‘above’ because, I think, it was determined that, financially, the UJA stood to lose more from the left if the BDS groups were excluded than they would gain from the right." By including the BDS groups, and thereby granting “cover and legitimacy to those who defame Israel as a warm criminal or who seek to harm Israel economically or otherwise,” JCRC is “failing in its duty," according to Zionist Organization of America (ZOA) president Morton Klein. Klein stressed that “Jews have a perfect right to live and build homes in Judea and Samaria, the Biblical and legal home of the Jewish people.” Instead of boycotting Israel, Klein suggested focusing "on the real obstacle to peace, the Palestinian Authority (PA)." Organizers of the rally against the BDS groups' inclusion call on those who cannot attend the protest rally, which will be held on Tuesday, April 8, between 4:00-7:00 pm, outside the UJA-Federation headquarters at 130 E. 59th St. in Manhattan, to send protest letters to the UJA and JCRC. Peter Kohlmann, executive producer of the parade can be reached at 212-983-4800 ext 162 (kohlmannp@jcrcny.org), while Michael Mittelman, director of the parade, can be reached at 212-983-4800 ext 487 (mittelmanm@jcrcny.org). “Let the directors of the UJA and other Jewish organizations know of your concerns," called Rabbi Spero. "Real Jewish leaders should not be indifferent, silent, nor lend support to boycotters and others wishing to tear us down." The rabbi added "directors of our Jewish organizations proved their fallibility during the 1930s and ‘40s, teaching us that blind obedience is foolish and leaving our destiny and safety to those who claim they ‘know best’ can be devastating. This time in history, we must not make the same mistake."